The dream of most Zone 7 gardeners is to have flowers in the garden for twelve months of the year. Somehow these hopes dim during the month of January when the landscape looks bleak under gray skies. However, there are a couple of plants that do produce flowers in January and February—and they are worth noting. Both Daphne odora and Clematis cirrhosa are two plants that can give much pleasure during these months. The luscious blooms of Daphne odora, coupled with a delicious scent, are enough to enchant us. Best of all, daphnes are poisonous so they manage to repel the hungriest deer. A Mediterranean plant, Clematis cirrhosa can grow in the Piedmont provided it has some protection for the cold winter wind. ‘Freckles’, the most common cultivar found in our area with flowers consisting of maroon speckles on a pale background, is hardy to 10 degrees F. The key to growing this plant is not to plant it too deeply. Both the daphne and clematis need well-draining soil if they are going to thrive. Because Clematis cirrhosa will go dormant in the summer it sometimes is paired with summer-blooming clematis. Prune it right after it has bloomed and you should have a long-lasting plant that gives you great pleasure for many winters. Alas, there is a downside to daphne: after delighting us in the garden for two to three years, tricking us into believing we are the ones who will break the daphne curse, it begins to wither away. All the experts from Bryce Lane of North Carolina State University to Jason Holmes at the Sarah P. Duke Gardens have assured me that sooner rather than later daphne will die. The mantra seems to be: enjoy them today for tomorrow they will be gone. o Daphne wants a well-draining soil that retains moisture. Amending our clay soils is a necessity. These plants are not good candidates for a rain garden. o Daphne prefers a mildly acidic soil so apply lime if the soil’s pH is below 5.5.
o Don’t know your soil’s pH? Get a soil test through your county extension office. 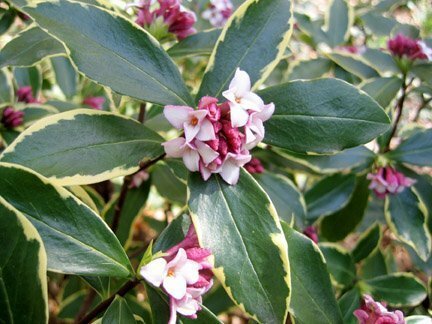 o Add compost to the soil before you plant your daphne. Not only does this provide good drainage but it also provides for beneficial bacteria and fungi. o Daphne needs some winter protection so consider planting it next to a stonewall that will absorb some heat from the winter sun. This is one time when it really helps to know your garden’s microclimates because daphne dislikes being frozen for even a couple of days. o Daphne responds to an occasional feeding. 1. Don’t overwater your daphne, but don’t underwater it either. 2. Place it in the sun, but beware of full summer sun. 3. Feed it some fertilizer without overfeeding it. 4. Have good, well-draining soil that doesn’t get too dry. 5. Try to have a pH that is less acidic that most of our acidic soils. There is one last rule. Savor your daphne while it is in bloom, admire this handsome evergreen plant and try not to take it personally when it begins to die. 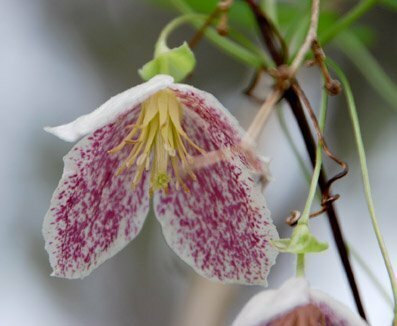 With luck your Clematis cirrhosa will be around to assure you that you really are a good gardener. A serious gardener for the past twenty years, Kit Flynn resides in Chapel Hill. She is also a Durham Master Gardener and a member of the Durham Garden Forum Advisory Committee.